A fine art quality, acid-free acrylic titanium primed artist canvas made from 100% cotton. 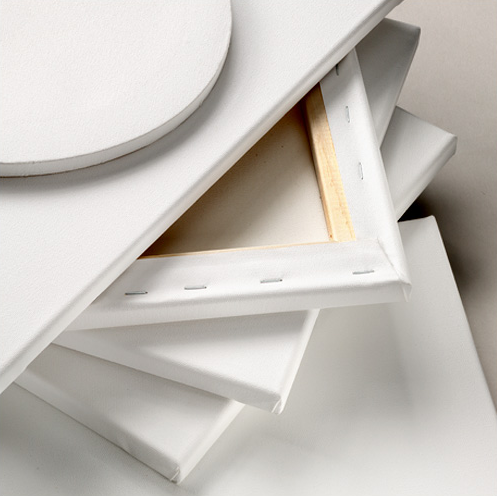 Wrapped around a 1/2" thick stretcher bar and stapled on the back, this canvas is suitable for both oil and acrylic. Now available in quantities of 1, 2 & 6 – making these panels more affordable than ever! Select Canvas Size8 x 10"9 x 12"11 x 14"12 x 16"12 x 24"14 x 18"15 x 30"16 x 20"18 x 24"18 x 36"20 x 24"22 x 28"24 x 30"24 x 36"Oval 5 x 7"Oval 8 x 10"Oval 9 x 12"Oval 11 x 14"Oval 12 x 16"Oval 16 x 20"